« Video: PFW – Who will win in the Wild Card playoffs: Texans or Bengals? Andy Dalton rolled his eyes and shook his head. The Bengals’ rookie quarterback couldn’t believe the play J.J. Watt made that turned the game around for the Texans. The 6-foot-5 defensive end fought off a blocker, leaped in front of Dalton’s pass and returned it 29 yards for a touchdown. It gave Houston the lead just before halftime, and the Texans never looked back in a 31-10 victory in the AFC wild-card game Saturday. Watt, also a rookie, works on plays like that in practice, but had never had an interception. And this one helped the Texans to the first playoff win in franchise history. The Bengals were making their third playoff appearance in seven seasons, but haven’t won since 1991, when they beat the Houston Oilers 41-14. “I’m disappointed that I wasn’t able to put us in position today to win the football game and get us over the hump here,” Bengals coach Marvin Lewis said. Chris Crocker dropped an interception on a drive by Houston in the third quarter. A dejected Crocker sat at his locker with his head down for a long time after the game. Three plays later came another of those plays. The Texans stretched the lead to 24-10 when Andre Johnson juked Adam “Pacman” Jones on a double move to get in front of him for a 40-yard touchdown reception. The Bengals had trouble containing Johnson, who was at full speed for the first time since injuring his left hamstring Dec. 4 and finished with 90 yards receiving. Dalton was 24 of 42 for 257 yards, while fellow rookie T.J. Yates was 11 of 20 for 159 yards in the first playoff game in the Super Bowl era matching two rookie quarterbacks. Dalton had thrown just one interception in the past six games, but was intercepted three times on Saturday. The second came when he threw a long pass under heavy pressure which was intercepted on fourth down by former Bengal Johnathan Joseph. Danieal Manning, signed along with Joseph to shore up Houston’s secondary in the offseason, grabbed the third one midway through the fourth quarter. That led to a 42-yard touchdown run by Arian Foster that made it 31-10. Dalton, who grew up in the Houston suburb of Katy and played in college at TCU, was sacked a season-high four times and tied a season-high with three interceptions while dealing with the rowdy, record crowd of 71,725. Cincinnati couldn’t get anything going on the ground against fourth-ranked rush defense and Cedric Benson finished with just 14 yards rushing. The Bengals didn’t score after halftime. They had a chance late, but a pass intended for rookie receiver A.J. Green on fourth down was batted down in the end zone. Green had four receptions for 42 yards in the first half, but added just one catch for five yards after that. “They made some great adjustments coming out of halftime,” said Green, who had 1,104 yards receiving this season. The Texans tied it at 10 less than two minutes before halftime on a 39-yard field goal by Neil Rackers. Johnson had a 17-yard catch on third down to keep that drive going, but couldn’t grab a throw from Yates in the end zone to force the field goal. Dalton was sacked by Brooks Reed for a 9-yard loss on third down to bring up a 50-yard field-goal attempt by Mike Nugent. The kick was long enough, but sailed wide right to leave the game tied early in the second quarter. Donald Lee grabbed a short pass from Dalton and two Texans missed a chance to tackle him and he made it into a 36-yard gain. An unnecessary roughness penalty by Antonio Smith got the Bengals to the Houston 33. They eventually settled for a 37-yard field goal by Nugent to go up 10-7 midway through the second quarter. 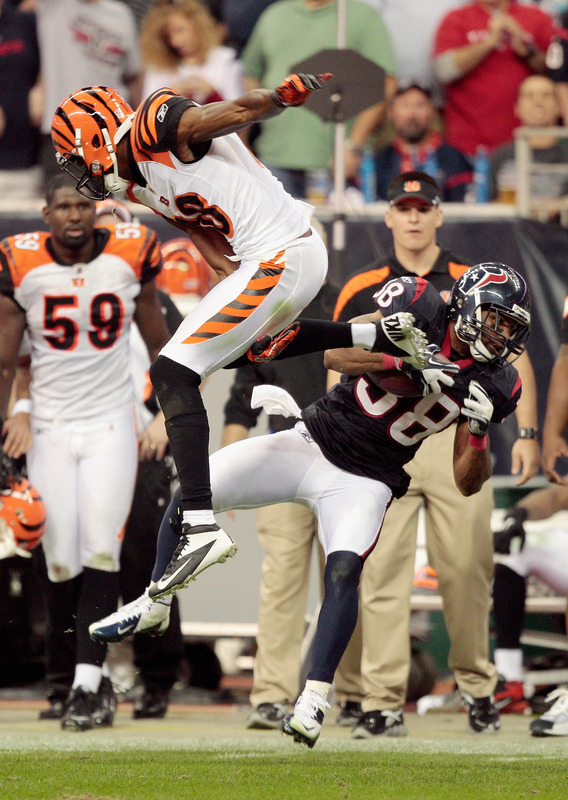 Cincinnati’s first score was set up by a 52-yard pass interference penalty on Houston’s Glover Quin. His foul on a deep ball thrown to Green got the Bengals to their own 28. Benson bulled into the end zone four plays later for a 1-yard touchdown to give Cincinnati a 7-0 lead. Houston’s first touchdown was also helped out by a penalty. Yates found Owen Daniels on a 21-yard pass and Reggie Nelson was flagged for a hit to the head of a defenseless player on the tackle to add 15 yards to the play. Foster took it from there with three straight runs capped by an 8-yard touchdown run where he cut to the outside for the score to make it 7-7 with about five minutes left in the first quarter.